Technican Ted, Where should I begin? Technician Ted is a sort-of-Manic-Miner-clone. It was released in 1984 by Hewson Consultants Ltd, in the UK with a initial price of £5.95. On opening the cassette box, you find an inlay with the general instructions and how to load. First thing you will notice is the interesting Loading System the game has. You are presented with different “Teds” of different colours walking from left to right as the tape loads. Also at the bottom it says how much time is left until loading has finished. Now that’s innovation! 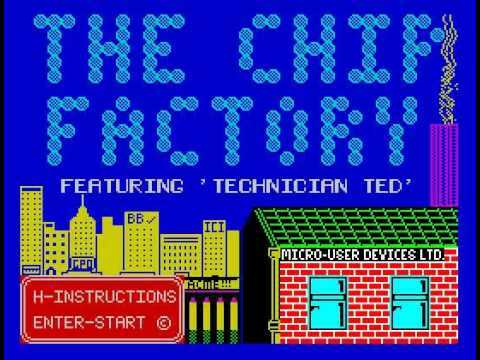 On completion of loading, you are presented with a nicely drawn picture with drop down balls that animate to create the words THE CHIP FACTORY. Music from the 48ks beeper is playing at this point, and clear instructions that say H for instructions, and ENTER to start the game. There is no joystick selection or refine keys. First thing i noticed when playing this game was the music. 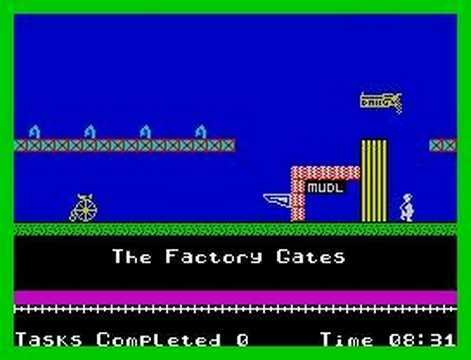 The music just like in a Manic Miner fashion plays constantly throughout, and is of a similar style. Almost everything on screen causes you to lose a life, so one thing I will say about this game, that it is extremely difficult. I don’t think I got past a few screens, it is very unforgiving in that respect. For its age, the graphics look pretty nice, has a splash of colour on different platforms etc, and considering the Spectrum had only been out a couple of years or so at this point, it’s not a half bad game! There are obvious similarities to Manic Miner, including the difficulty aspect, so the chances are if you are epic at Manic Miner you will probably be pretty good at this. Im not good at either though! As I was around two years old at the time, Technician Ted passed me by on it’s original release. No one in the family had a Spectrum back then, or in fact a video computer system at all. If I was my age now (34) in 1984, I would have definitely bought this for the low price tag. It’s simple, it’s clever, it’s very hard and a challenge. It features some great music, and even mixes in sound effects with the music – all on just the 48k beeper! When you jump the music stops to provide the jump sound but it’s that close it’s hardly noticeable. You could be forgiven for thinking it’s playing in a separate sound channel. All on a 48k machine! Each screen is different from the last, some with different enemies which adds to the variety. The Lift Screen is very innovative for a game like this especially in 1984. The way to work the lift is you jump into one of those numbers (buttons) and when you leave this screen to the left, you’re on a totally different screen as if you’ve gone up or down a lift. It’s awesome that! So to sum up, I recommend this game if you don’t have it on your Sinclair Spectrum. It’s fun, it’s hard (sometimes frustratingly hard) but it’s a good game to add to any collection. It provides a new adventure if you like Manic Miner style games and is just as hard. My score : 8 out of 10. Share the post "Technican Ted"
Next Post:Review – The DivMMC Future SD card interface – Jumperless and Zero Configuration!